[T]he video makes the case that the rich have become disproportionately wealthier over time. Again, so what? This is simply an example of Pareto’s principle that a small minority generates the majority of production. As such, they receive the majority of the wealth created. The key point to understand is that both the rich and the poor have become wealthier over time. According to data from the U.S. Census Bureau, from 1967 to 2009 the real mean household income of the top quintile increased by 71 percent. Over the same period, the real mean household income in the bottom quintile increased by 25 percent. As you can see, over the past few decades, the top five percent of households have seen massive rises in their wealth while the lowest 60 percent have actually seen their wealth decrease. Zhao is wrong: both the rich and poor have not become wealthier over time, only the rich have. The freshman continues on to correctly point out that the video implies “that CEOs do not deserve to be paid what they’re paid. Zhao’s right: CEO pay does not represent the work effort of the CEO, but instead measure the CEO’s value to the company. Some CEOs may be worth 380 workers. Others may not be. The comparison is not meaningful. 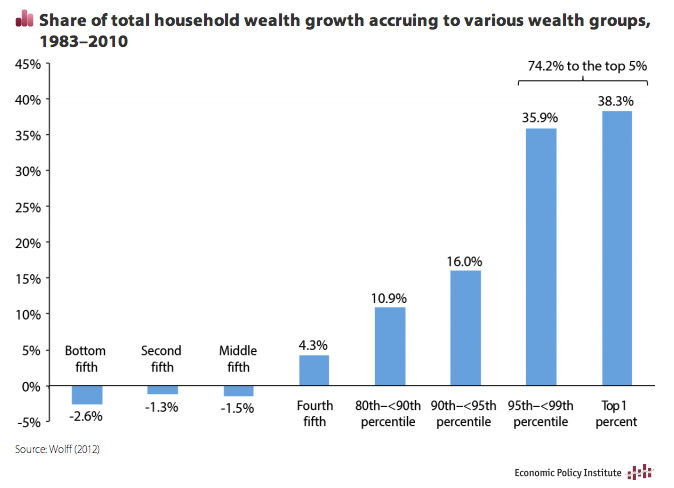 The video uses it to emphasize that wealth inequality has risen in recent years. If that rise had coincided with increased wealth for everyone, than Zhao could be right that it is just the price of the country growing richer (see more from Ezra Klein on why it still would be an issue). Nevertheless, the fact of the matter is that the poorest have lost wealth over the past 30 years and the rich have seen huge gains. The “rising tide” lifted a few boats way in the air while drowning everyone else. On a separate note, it’s disappointing to read through the comments on the article and see very few people engaging Zhao’s argument. These are complex, important topics and the difference between wealth and income is especially vital. Most people in the comments simply attack Zhao morally without responding to his article whatsoever. The Duke Community can do better.